When you sign up for GrabCAD for the first time, you are taken through one of two registration flows, depending on what part of the site you were asked to log in to use. For instance, if you are trying to download a file from the CAD Library, you will be asked to sign up for the GrabCAD Community, while if you are being invited to your teammate's Workbench project, you will be asked to sign up for Workbench. Both sign-up flows will make you a "GrabCAD member" and establish your profile and settings page. Additionally, both give you access to the CAD Library and all the features of the GrabCAD Community. To learn more about the GrabCAD Community, click here for more help articles. The difference is that signing up for Workbench gives you a Workbench account, whereas signing up with the Community flow does not. If you had previously signed up for GrabCAD to use the Community but would like to expand this existing account for use in Workbench, head here to get started. What is a Workbench Account? Your Workbench account is the central online repository for your projects, and the access point for you and your team. 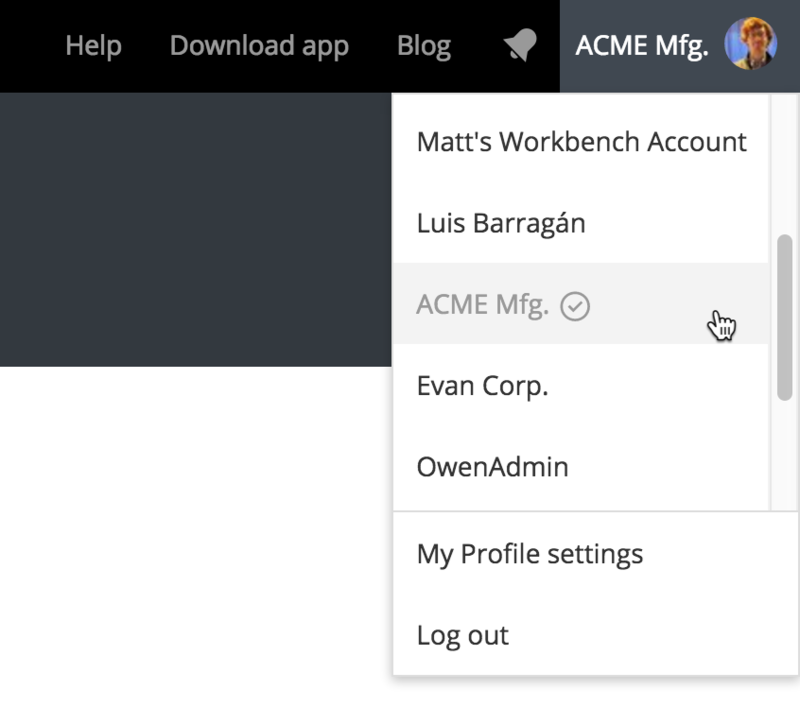 If you are the account admin, you can manage your team and their access to your projects. If you are not the account admin but are a collaborator on one or more projects, you can still create new projects in the account, and your account admin will be able to join them. For information about getting in sync with projects in other accounts, see here. If another user invites you to a project on their account, you may notice multiple accounts are now available in the upper right corner. Accounts have separate teams and separate projects. Users on your account cannot see users or projects that are on another account of yours. NOTE: If you don't see the expected list of projects in the Desktop App, you may have selected the wrong default account during setup. To fix this, go to the settings menu in the app and click "Change default folder and account." If you are the admin of an extra or unwanted account, please contact support@grabcad.com and we can take care of that for you right away.